LADEE is no more. It crashed into the surface of the Moon on April 17, as any low-altitude lunar mission running low on fuel inevitably will. As a mission that studied the lunar exosphere in situ, the closer they were able to fly to the surface, the more atmospheric molecules and particles they were able to taste. According to project scientist Rick Elphic, the final days of the mission have turned out to be very productive, as hoped. So, before I say anything more: congratulations to the LADEE team for a job well done, and I'm looking forward to all the science results yet to come! But they have already released one really cool set of data, one that didn't come from the science instruments, but rather from an engineering camera. LADEE's star tracker instrument (used for spacecraft navigation, to help the spacecraft autonomously determine its orientation in space) was, like many star trackers these days, a camera. And they used it in a really cool way, to watch the Sun rise over the lunar horizon during one of their really low-altitude orbits. Here's the animation, which I've looped so you can watch it over and over. The LADEE Moon orbiter took this series of images of the Sun rising above the lunar horizon on April 12, 2014, just five days before LADEE's orbit decayed to the point where it crashed into the lunar surface. The series begins with LADEE viewing the lunar horizon ahead, a few minutes before orbital sunrise. At this position, there is already a glow of zodiacal light in the sky above the completely dark surface of the Moon, though the Sun is many degrees below the horizon. LADEE’s orbital motion makes the stars appear to move to the left. The same motion brings the Sun closer to the horizon ahead and the glow gets brighter. In fact, the glow becomes so bright, parts of the image are saturated. Finally, sunrise fully saturates the camera image. Taking images is an unusual task for a star tracker, since its main purpose is to determine where in space it is looking, like a navigator, so the spacecraft can know its attitude relative to sun, moon and Earth. It so happens that the star trackers are able to compress and save images every eight seconds. If those images contain not just stars, but the dark limb of the unlit moon, an interesting possibility presents itself: what if we could reproduce the famous view that Apollo astronaut Eugene Cernan sketched more than 40 years ago? What if we could see a horizon glow just before orbital sunrise? Might we see levitated dust, illuminated by sunshine while LADEE is in the dark shadow of the moon? Here's the oft-reproduced page of Cernan's observations. What the Apollo astronauts saw in the lunar sunrise was attributed to three sources. Of these, one was external to the Moon -- zodiacal light (annotated in red) -- and two were hypothesized to result from dust levitated above the lunar surface -- lunar horizon glow and crepuscular rays (annotated in blue and green). This is a sketch of the lunar sunrise seen from orbit by Apollo 17 astronaut Eugene Cernan. Highlights in the right image show the sources of the scattered light. But it sure looks like sunrise is just as impressive from LADEE's vantage point as it is to us on Earth. Indeed it does. And it took delicate work to obtain the beautiful sequence of photographs from a spacecraft skimming within a few thousand meters of the surface of another world. Again, I congratulate the LADEE team on their fine mission. Before the crash the publically announced estimate for the crash date was April 21st. So I am wondering if the crash on April 17th may have been a surprise to the project team? Any unknown mountain peak that was in the way? Or - did it really crash on April 17th or did it just loose the communication system? There is probably no means to verify that. Edgar, I was confused as well. April 17th was nowhere near my 'take the plunge' guess. I found this post on Ladees official site. http://www.nasa.gov/ames/ladee-project-manager-update-who-s-afraid-of-the-dark/ I think there was uncertainty in how such a low orbit would influence the satellite. In the caption to the gif sequence it states that the motion of the spacecraft makes the stars appear to move to the left. On the contrary, the stars appear to be moving directly upward, slightly angled to the right. 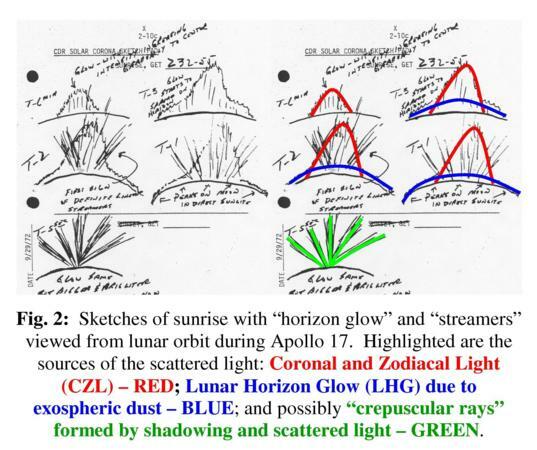 On the issue of the interpretation of 'crepuscular rays' in Apollo 17 commander Gene Cernan's sketches and notes, it is curious that they were not reported to exhibit substantial change or motion, as one would expect with the rapidly changing geometry between the position of an orbiting spacecraft with respect to surface topographic features and the light source beneath the horizon. I am not alone in having concluded long ago (circa late 1970's) that what Cernan and other Apollo astronauts saw in the 'radial streamers' before orbital sunrise and after sunset were in fact features of the outer corona of the Sun. It's too bad the LADEE team were not able to confirm a hypothesis that's been adhered to by some for 40+ years, but its good to know that science rejects and corrects as well as adds. A negative result shouldn't be viewed as a disappointment, but a liberation.